Their names are Héctor, Brenda Karina, Jorge Antonio, Dan Jeremeel … The list goes on and on. Some were last seen being taken away by military or police, like the 43 students of Ayotzinapa. Others left their homes but never arrived where they were going. All disappeared, never to be seen again. It’s nothing less than an epidemic. More than 35,000 people are now reported missing, at least half of them during the current government of President Enrique Peña Nieto. Families desperate to find their loved ones meet with indifference or hostility from officials whose ‘investigations’ are destined from the start to lead nowhere. Everyone knows how dangerous it is to pursue the truth about what happened and who was responsible. Two mothers looking for missing children have been disappeared. Other families are at risk as they continue to seek answers, tormented by not knowing if their loved ones are still alive, hoping to be rescued. In the midst of this nightmare, fuelled by corruption and complicity on the part Mexican authorities, there is hope. Families of the disappeared are finding strength by joining together to speak out. Their courageous, inspiring efforts call out for our support. Together we must make this crisis visible and press for urgently needed action. The beautiful Monarch butterfly is an evocative symbol for our solidarity because it joins Canada and Mexico via its life-giving migration between our two countries. We are collecting unique, eye-catching messages of concern and solidarity written on coloured paper cut out in the form of a butterfly. 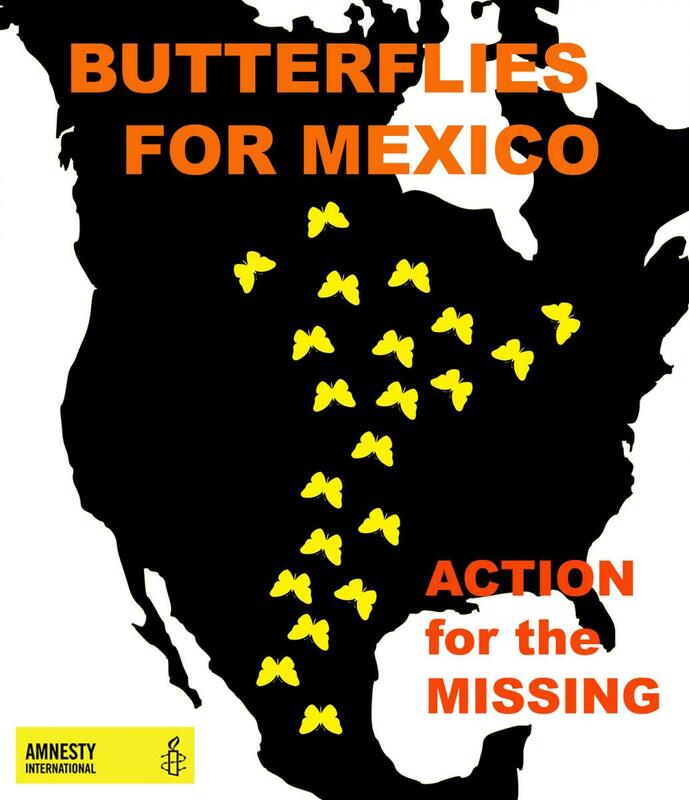 The butterfly messages will be delivered to organizations of families of the disappeared in Mexico. We will also share photos of the messages with officials in Mexico and in Canada to make visible our concern and our support for the legitimate demands of the families of the disappeared. Here's how you can take part! 1. Create your butterfly. Below, you will find downloadable templates of butterflies. Or draw your own. Cut out the butterfly shape, then decorate with bright colours, bearing in mind that our messages will have more impact if they do not all look the same. 2. Write a short, personal message of concern in English and/or Spanish on your butterfly, followed by your name, city and country – for example: “I stand with the families of the disappeared in Mexico. It’s time for action, truth and justice. Alzo la voz en solidaridad con las familias de los desaparecidos en México. Exijo acción, verdad y justicia. Elizabeth Simpson, Montreal, CANADA”. 4. If you are able, go one step further. Take a photo holding your butterfly message beside your face (close-ups are the most effective), share on social media and invite your friends to support our campaign for the families of the disappeared by following the instructions at www.amnesty.ca/butterflies. Please send your photo to kprice@amnesty.ca. You may also wish to organize a kitchen party or community event to create butterfly messages. Amnesty supporters in Timmins, for example, enlisted the support of the public library, which offered its window to display the butterfly messages created by community members. Take lots of photos of your activism and be sure to send them to us, along with the butterflies. Thank you for taking action! Together we can make a difference!